Learn how to become an effective small group leader with this unique 12-part DVD. Each 12-minute session is packed with biblical leadership principles and practical small group facilitation techniques to prepare and equip small group leaders. The last four sessions provide fun role play sessions that will equip small group facilitators to lovingly encourage the typical personality types that can be a challenge. 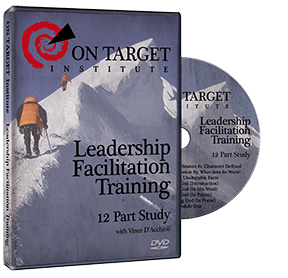 This Leadership Facilitation Training series is ideal for all types of small groups including the OTI Men’s groups, church bible study small groups, and youth small groups.